We get many requests for an inline oil filter to use with the ball bearing turbos and other turbos we offer. 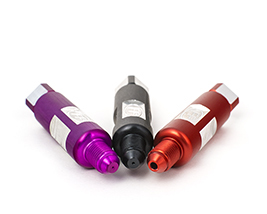 So we created 3 very useful inline oil filters. These filters are color coded for their orifice diameter. The black filter is used in ball bearing applications and has a .030" restrictor, the Red filter is .125" for full flow journal bearing turbos, and the Purple .020" filter for use with our Xona Rotor turbochargers. The filter is made with female 4AN at the inlet side and male 4AN at the outlet side. This allows the filter to install into virtually any 4AN line without additional fittings. The FP4ANFilter features a 10 micron replaceable filter element that captures oil contaminants in its basket. The filter basket is easily removable for quick inspection and cleaning. The filter can be run in either direction, but the preffered flow direction is in the female side and out the male side. This allows all the contaminants to be collected inside the filter basket rather than collecting the contaminants all over the outside of the filter basket. GT CHRA Ball bearing applications: The body of the black filter features a built in .8mm (.030") restrictor as recommended by Garrett for use with their GT25R, GT30R, GT35R cartridges. Usage information: Remember that the filter can become clogged. While you may have prevented a turbo failure by filtering out contaminants, you can CAUSE a failure by limiting oil supply through a plugged oil line filter. Check the filter regularly, inspect the filter whenever you perform an engine oil change. Turbo failures resulting from plugged filters are the responsibility of the user. The user is responsible for verifying that sufficient oil pressure is present at the turbo oil inlet. Turbo failures resulting from over restriction of the oil feed line is the responsibility of the user. Our Promise to You: FP turbocharger customers who use the FP4ANFilter on their FP turbos for the entire service life of the turbocharger will NEVER pay for a turbo repair resulting from oil contamination. This promise protects you against oil contamination only and does not extend to failures due to insufficient oil supply, plugged filter, excessive EGT, failure to connect coolant lines to the turbo, or blade damage resulting from fingers, rags, O2 sensor pigtails, boost controller vacuum lines, stray washers or small rodents that may get sucked into the turbo or object such as valve, valve guide or piston chunklets that may get spit out of the engine. FP turbo customers who have used the FP4ANFilter for the entire service life of the turbocharger should send in a copy of the original invoice showing the simultaneous purchase of the FP4ANFilter and the FP turbo that is being presented for servicing or repair in order to benefit from this oil contamination protection promise. Want this item shipped on April 22? Order within the next 62 hrs 35 mins.